Attorney Robert Barnes, a contributor to the LawNewz blog, analyzed the New York Times story that Donald Trump Jr. met with a Russian lawyer last June. He also discussed at length with Breitbart News Daily on Tuesday the appointment of Robert Mueller as special counsel to investigate the 2016 election. In the latest development of the email story, three anonymous sources described an email which informed Trump Jr. in advance that information was provided by the Russian government as part of a plan to help his father win the 2016 election. Donald Trump Jr. subsequently released the entire email chain via Twitter, shortly after Barnes completed his Breitbart News Daily interview. SiriusXM host Alex Marlow noted that a comparable meeting between a Democratic campaign and an activist foreign lawyer would have been spun as international outreach and “bringing more voices to the table” in a campaign with global vision. Marlow observed that the Politico story about Clinton’s campaign and Ukraine that Barnes referenced has suddenly popped back into the news, despite receiving relatively little attention when it was written in January. “People are pointing out, well, if that was a crime, then clearly what happened with Ukraine was a substantial and much more severe crime, given that it was their actual government officials involved in propagandizing information against then-candidate Trump in order to help Hillary Clinton win the election,” he said. Barnes predicted that the Trump White House’s response to the story would be determined by how much traction it gains, noting that if it fades quickly, they would be wise to let it go. He agreed with Marlow’s point that Donald Trump Jr. was being targeted because he was effective, while the Clinton-Ukraine story faded quickly in part because Hillary Clinton lost the election. “The key fact that refutes it is first, that Podesta was subject to a phishing process, which doesn’t make sense if Russia was the one that did it,” he said, joining Marlow in lambasting Podesta’s extremely poor password security. “His password was ‘password.’ That’s the genius who wanted to be the next chief of staff for the next presidency of the United States,” Barnes chuckled. “Russia’s defense is likely right. Russia likely had nothing to do with hacking any aspect of those emails. All they did was tell the truth about the corruption of the Democratic National Committee and Hillary Clinton anyway,” he said. Marlow turned the conversation to another story from the 2016 election making headlines this week: the revelation that about half of former FBI Director James Comey’s ostensibly personal memos contained classified information, which raises the possibility that some of what he deliberately leaked to the media was classified. 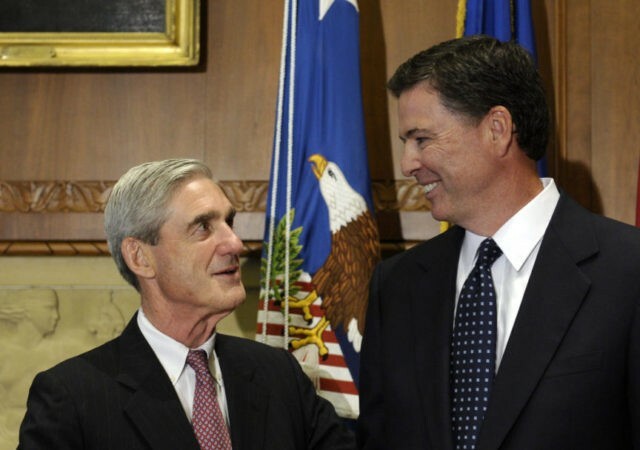 “It could be a very big deal because if you have the head of the FBI knowingly and deliberately leaking classified information when he was supposed to be running an investigation into people leaking classified information because according to his own testimony to Congress, he took it very seriously, then you have issues about whether he committed perjury because he made statements about his memos not having classified information before Congress,” Barnes noted. “I think he’s seriously problematic, and he’s put all of his cards on the table, as ex-congressman Gingrich pointed out, by who he’s chosen to staff his team with. He shouldn’t have even been hired legally. It was done in an improper process,” he charged, finding it significant that Mueller did not cite his retirement to turn the appointment down. “I always say that the kind of people who should recuse themselves don’t, and the kind of people who don’t need to recuse themselves, often do,” Barnes observed wryly, citing Attorney General Jeff Sessions as an example of the latter. “Bob Mueller is a serious problematic concern. My view is that he should have been canned, but I understand the political problematic consequences of trying to do so now. But you have a highly unethical, highly partisan special prosecutor, unlawfully appointed, running a witch hunt against the president and his allies,” Barnes said. “They should have set this story framework up in a way that justified his firing, that didn’t make it look like it appeared to be. I think Trump really regretted his decision and maybe was a little tempestuous in his reaction, and there weren’t key people around to give the right advice,” he said. “But some of those advisers have the kind of relationships that are hard to terminate,” he added coyly. Marlow proposed that the larger strategic problem facing the Trump White House is that stories from the Comey firing to the Trump Jr. email story leave them perpetually playing defense, with little media attention left for any portion of President Trump’s policy agenda. Barnes agreed that burying the Trump agenda has been a largely successful objective of the media war against this presidency and faulted the president’s team for not understanding that such attacks have been launched against all populist outsider candidates. “Here you have the most powerful government in the world – the most powerful Deep State in the world – that was out to get Trump, and you notice any time Trump deviates from a Deep State narrative or objective, such as, ‘Hey, let’s do a detente with Russia. Let’s see if we can solve the Syrian crisis. Let’s see if we can get that done,’ within 48 hours, you have some personal hit attack come out on Trump, usually connected to some sort of leak story, often leaked national security information,” he noted. “The one downside for Democrats is, as long as they obsess over Russia, as Michael Tracey talked about the other day for CNBC, the Democrats don’t have a coherent, cohesive agenda going into 2018, and they risk self-parodying themselves. It’s what happened to Republicans in ’97 and ’98. They became so obsessed with Clinton and Lewinsky that in the end, it was they who became self-parodying and self-satire, and it hurt them in the midterm elections that term. That cycle that was supposed to be good turned out to backfire pretty bad,” he recalled. He cited the Democrats’ defeat in the Georgia District 6 special election as an example of such political fallout. “Going into the swamp is going to get dirty, ugly, messy, and smelly. That’s where Trump is, and he’s just doing the best he can under difficult circumstances,” he concluded.